This article deals with the culture and society of the ancient Assyrians. Another article looks at the rise and fall of the Assyrian empire in more depth. In the first millennium BCE, ancient Mesopotamian civilization pioneered the first true multinational empires in world history. The Assyrian empire was the first of these. The kingdom of Assyria emerged as a major regional power in the second millennium BCE; however, it was in the early first millenium BCE that the Assyrians expanded their realm into a huge empire, covering much of the Middle East. This article focusses on this period of its history, between 911 BCE and 611 BCE; these three centuries formed one of the last chapters in ancient Mesopotamia’s history. King Adad-nirari II (911-891 BCE) begins Assyrian fight-back against Aramaian invaders. King Ashurnasirpal II (883-859 BCE) starts the period of great campaigns across the Middle East, who had overrun much of their country in the century after 1000 BCE. King Shalmaneser III (858-824 BCE) sees the high point of early Assyrian power, but is followed be a period of instability and weakness. King Tiglathpileser III (744-727 BCE) carries out wide-ranging reforms, creating a true Assyrian empire. King Sargon II (722-705 BCE) invades and destroys the kingdom of Israel. King Sennacherib (705-681 BCE) sacks Babylon in 689 BCE. King Esarhaddon (681-669 BCE) brings the Assyrian empire to its greatest extent by conquering Egypt (671 BCE). King Ashurbanipal (669-627 BCE) presides over the last great phase of the Assyrian empire, but fails to hold on to Egypt. In the years after Ashurbanipal’s death, revolts and invasions overwhelm Assyria, and its cities are sacked and the country devastated in 612-11. The ancient kingdom of Assyria was located in present-day northern Iraq. It bordered eastern Syria and south- eastern Asia Minor. It covered the most northerly portion of the Mesopotamian plain, with the river Tigris flowing through it. The land was flanked to the north and east by the Zagros mountains, to the west and south by desert. The climate of northern Mesopotamia is cooler than in southern Mesopotamia, and the levels of rainfall higher. This means that irrigation is not essential to farming, though, as with agriculture in many parts of the world, it does allow more intensive farming than would otherwise be the case. Assyria belonged to the world of ancient Mesopotamia. However, whilst steeped in Mesopotamian culture from early times, Assyrian society developed some distinct features of its own. Its exposed position – bordering as it did lands of warlike mountain peoples and desert tribesmen – meant that its people developed a strong military tradition. This enabled them to survive periods of invasion, and then to conquer the largest empire world history had yet seen. At its height this empire stretched from Egypt to the Persian Gulf, taking in the areas covered by the modern countries of Israel, Lebanon, Syria, Iraq, plus parts of Jordan, Turkey, Armenia and Iran on the way. Assyrian was an integral part of the ancient Mesopotamian world, and had come increasingly under the influence of Sumerian civilization from the 4th millennium onwards. In the 2nd millennium it had become one of the great powers of the Bronze Age Middle East, along with the Hittite Empire, New Kingdom Egypt and Babylon. The centuries around 1000 BCE had seen a general crisis in the Middle East, and Assyria had not escaped. It shrank to a fraction of its former size. However, by the mid-9th century Assyria was on the the offensive again, and little more than a century later had conquered an empire covering all Mesopotamia and Syria, plus parts of Asia Minor, Palestine, Iran, and the Taurus and Zagros regions. For more than a hundred years the Assyrian empire dominated the Middle East, before crashing down to destruction at the end of the 7th century. As with all Mesopotamian states, Assyria was a monarchy; the king was the divinely-appointed, all-powerful ruler of the Assyrian people. His titles claimed universal sovereignty: “Great King, Mighty King, King of the Universe, King of the country of Ashur”. Like all previous Mesopotamian monarchs, the king of Assyria was the national god’s appointed representative on Earth (in this case, Ashur’s). He was the chief lawmaker, the chief administrator, and above all, the commander-in-chief of the Assyrian army. The king was surrounded by a large court of ministers, officials and servants. His chief ministers included a chief of the army and a chancellor, who probably headed the large administrative staff. There were also palace officials who ran the huge royal household, buildings and grounds. The role of some of these officials closest to the king, such as the chief cup-bearer, must have blurred the line between domestic and public: if he was in the king’s confidence then he will certainly have exercised considerable influence over matters of state. The bulk of royal officials will have been recruited from the Assyrian aristocracy; some, however, came from humble, even slave, origins. A large number of palace officials, as with many Eastern courts, were eunuchs. The act of castrating a man theoretically freed him to serve the interests of the king alone, not those of his relations. A vast flow of correspondence reached the palace from all over the Assyrian realm, and beyond; an staff of scribes would have been needed to deal with this, and senior officials and ministers would have had the responsibility of deciding which matters required the attention of the king himself. It is apparent that the great line of kings who ruled Assyria in its pomp dealt with all important matters of state personally, and probably a great deal more besides. The Assyrian monarchy was, again like all Mesopotamian monarchies, hereditary, from father to son. One of a reigning king’s sons was designated crown prince, and trained to succeed his father. Things did not always work out as smoothly as this suggests, however (see below). The area of the Middle East dominated by Assyria was divided into the Assyrian homeland, the kingdom of Assyria, and a much larger area. In earlier times this was covered by vassal kingdoms, but later much of it was governed directly from the Assyrian court through provincial governors. At the centre (if not geographically, certainly politically and socially) stood the Assyrian homeland. Here was located the Assyrian capital, with its magnificent palaces, parks and temples. The original capital, Ashur, was also the centre of the worship of the chief god of the same name, and long after it had ceased to be the centre of government was revered as a holy city. Nineveh was the capital of the Assyrian empire at the time of its heyday, and as such was certainly one of the largest cities in the world at that time. Other capital cities at different times were Nimrud and, briefly, under Sargon II, Dur-Sharrukin (which means Sargon’s fortress). The Assyrians were farmers, like all pre-industrial peoples. All land theoretically belonged to the king, and in reality the king did indeed own vast estates. A landed aristocracy also controlled much land, however; and through holding local public office these probably dominated many localities. It may well have been to reduce their influence at court that Assyrian kings shifted their capital from time to time. All Assyrians owed duties to the king. All adult males were liable to military service, and the core of the Assyrian army was made up of such men. When not on campaign they formed a reserve from which soldiers could be recruited. At critical times a large percentage, perhaps even the majority, of the younger men would be called up. Assyrians could also be summoned to undertake other kinds of service, for example working on the royal estates or on large-scale royal construction projects. Away from the capital, the Assyrian homeland was divided into a number of districts. Tiglathpilisar’s reforms made these local divisions smaller and more numerous, bringing them more directly under the control of the central government. These districts were in turn divided into sub-districts, under local chiefs (probably appointed from a member of a leading local family); and these were divided into townships. Up to the mid-8th century the Assyrian homeland was surrounded by an expanding swathe of territory in Mesopotamia, Syria, eastern Anatolia and western Iran – a significant chunk of the Middle East – composed of vassal kingdoms owing obedience to the Assyrian king, sending troops to fight with the Assyrian army, and paying tribute to the Assyrian court. Most of these vassal kingdoms were small states. The exception to this was southern Mesopotamia, which since the days of Hammurabi had been mostly ruled from Babylon. This key economic region was the core area of Mesopotamian civilization, and was treated with much more respect and consideration then other parts of the Assyrian sphere of influence. Here, the Assyrian king posed as a protector of the king of Babylon, fighting on his behalf against his enemies. In return, he expected obedience. 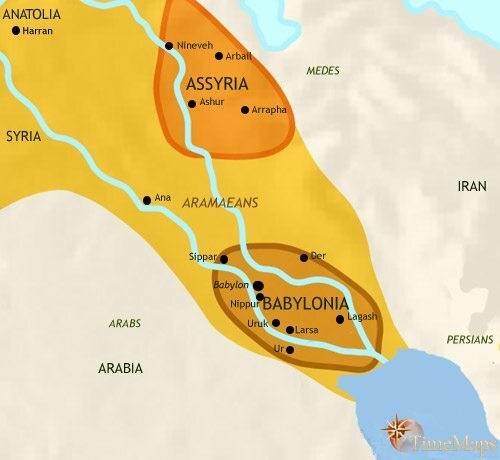 Up to the mid-8th century the Assyrian homeland and the much larger, and expanding, territory occupied by vassal kingdoms, made up the two zones of Assyrian power. From the time of the reforms of king Tiglath Pilisar, a third zone was interposed between these two older ones, as a large part of Assyrian-dominated territory was brought under the more direct control of the Assyrian court. This zone covered much of Mesopotamia and Syria. In it, the small vassal kingdoms were abolished, their kings being replaced by officials appointed by the Assyrian king. These provincial governors were supported by new garrisons of Assyrian troops, stationed in the provinces on a permanent basis. Babylonia also was brought under more direct Assyrian control, but in a different way from the smaller vassal kingdoms. The Babylonian throne was no longer occupied by a native dynasty, but by a member of the Assyrian royal family. Initially this was the king of Assyria himself, who thus became king of Assyria and Babylon. He ruled the country through a viceroy (a governor with very wide powers). Later, a younger son or brother of the king of Assyria occupied the throne of Babylon as a subordinate king. An efficient system of communications between royal court and provincial governors was set up, consisting of special couriers who carried messages swiftly between the king (wherever he happened to be) and his governors. Fire signals were also used. The roads were kept in good repair, wooden bridges were constructed across bridges and paved ways were driven through mountainous country, to facilitate the swift passage of messages. This system acted as the precursor of later imperial road networks in the Persian, Hellenistic and Roman empires. The Assyrians also ran a state espionage service, to keep themselves informed of potential unrest. From the mid-8th century onwards, therefore, Assyria turned from being the dominant power in the region, lording it over numerous smaller or weaker kingdoms, to being a true empire with a centralised government. As such, it would have an immense influence on later world history, pioneering the techniques for administering a huge empire which would be passed on to later imperial states. The Assyrians, like previous Mesopotamians, published their own law code. This was much longer than Hammurabi’s, and more sophisticated, in that it went into more detail in particular cases. However, it was noticeably harsher, with more brutal punishments for wrongdoing. This perhaps reflects the more militarized society for which it was intended. The Assyrian governing system suffered from regular bouts of instability. Like many autocratic monarchies, the system had a crucial weakness at its heart: whenever a king died (and several Assyrian kings were assassinated), there was the potential for trouble as rival princes vied for the throne. Several kings had to fight their way to the throne in civil wars which sometimes lasted several years. These conflicts were not necessarily simply between different members of the royal family. It seems clear that these would be backed by factions within the Assyrian nobility. Some of these may have had roots in particular areas, for example in and around the capital city. In these circumstances, once a king had defeated his rivals, he sometimes felt the need to move the capital to another city, or indeed build a completely new city (as happened on at least two occasions), to reduce the influence of those nobles who had opposed him. Assyria’s subject peoples naturally took advantage of these civil wars to attempt to free themselves from the heavy Assyrian yoke. Indeed, throughout their history, and despite the merciless reprisals that they visited upon defeated rebels, the Assyrians constantly had to deal with vassals seeking to shake off their rule. Because of its great prestige and wealth, the region of Babylonia played a key role in the dynamics of the Assyrian political system. The practice of appointing younger brothers of a king of Assyria to be king of Babylon had the opposite effect from that which had been intended. It was hoped that this key region would thus be brought under the tighter control of the Assyrian kings. Unfortunately, despite their close family relationship to the Assyrian king, the kings of Babylon had a tendency to rebel against them. Revolts in such an important area of the empire was a grave matter for the Assyrian king. One such period of instability started in 652, when the king of Babylon enlisted the support of many of Assyria’s enemies in a revolt against his elder brother, the king of Assyria. It took many years’ hard fighting for the latter to put this revolt down. A generation later another rebellion by a king of Babylon would precipitate the fall of Assyria itself. On this occasion, this king succeeded in his aim of making himself king of Assyria; however, with Assyrian forces distracted by civil war many of Assyria’s subject peoples once again asserted their independence. Scythians and Cimmerians from the steppes north of the Black Sea raided unchecked through Assyrian territory in Anatolia and northern Assyria, Babylonia itself broke completely free from Assyrian rule, and very shortly the Assyria succumbed to invasions from all sides. Assyria’s imperial power was based squarely on its army. Assyria’s military practices had roots in earlier Mesopotamian warfare; however it introduced major innovations of its own. The Assyrian army was one of the first major military force in world history to benefit from iron armour and weapons. Whereas the earlier armies of the Bronze Age and early Iron Age had been built around a comparatively a small number of aristocratic warriors fighting from chariots, under the Assyrians the cheaper but tougher iron enabled the Assyrians to arm many more ordinary subjects. Their army was therefore able to be composed of much larger bodies of infantry and cavalry than hitherto. The cavalry were now largely made up of soldiers riding on horses, and warriors riding in chariots became less important in the army. The Assyrians learnt this new style of cavalry warfare from the Cimmerians and Scythians, the horse-riding nomads from steppes of central Asia. All horsemen at the time rode without stirrups or saddles, but this seems not to have hindered their ability to control their mounts. Both cavalry and infantry formations now went into battle to fight, not as individuals, as the old Bronze Age warriors had done, but as unified, disciplined bodies of troops fighting en masse. Before the mid-8th century, the army was essentially a citizen army, composed of ordinary Assyrian farmers performing their military service. The men called up for a particular year were stationed in camps, before being sent off on campaign. Those not called up at the start of a year might still find themselves called up later, to replace losses or if additional troops were needed. This system continued into later times, but was now supplemented by a standing army of foreign troops, made up of contingents from conquered peoples. These soldiers served for many years at a time; they were able to attain a higher level of experience and training, and, free from the need to return to their farms for the harvest, they were able to serve on longer wars rather than the seasonal campaigns of old. This also allowed permanent garrisons to be stationed at key points within the Assyrian empire, answering to the provincial governors. These helped to keep the subject peoples and neighbouring vassal kingdoms in check. It was from these long- service professional troops that the royal guard, the elite troops of the Assyrian army, were formed. Assyrian inscriptions testify to the importance that commanders accorded logistics. Food and military supplies were gathered together in preparation for a campaign and transported (occasionally using camels as beasts of burden) with the army on the march. Also travelling with the army was a siege train, staffed by a corps of engineers. Their job was to fill in moats, construct earthworks against walls, and dig tunnels. They were equipped with the first recorded siege engines in world history, including battering rams, assault ladders and even siege towers for scaling the mud brick city walls of the ancient Middle East. Assyrian imperialism was of a particularly harsh variety. The tribute exacted from vassal kingdoms seems to have been very heavy. It did nothing to promote the economic welfare of the subject peoples, as can be seen in the impoverished remains of many towns and cities of the period; and it provoked repeated revolts, despite the cruel fate awaiting defeated rebels. By contrast, the remains of cities in the Assyrian homeland reveal a magnificence and luxury unparalleled in the ancient Middle East up to that time. This clearly indicates that the Assyrian imperial system was an engine for hoovering up wealth from the provinces for the benefit of the ruling class. From the mid-8th century the Assyrians practised a policy of mass deportation. Conquered towns and districts were emptied of their inhabitants, who were resettled in distant regions, to be replaced by people brought in by force from other countries. The most famous example was the destruction of the kingdom of Israel in 722 BCE, described in the Bible. The aim of this policy was to punish rebels, prevent rebellions by undermining local loyalties, to populate new towns, either in conquered countries or in the Assyrian heartland to develop agriculture in under-populated regions, and to provide the Assyrian state with the troops, labourers, craftsmen, and even civil servants it needed. The deportees were not slaves; they had the rights and duties of other subjects of the Assyrian king; and there is evidence that they were to prove amongst the more loyal subjects of the Assyrians. It has been estimated that four and a half million people were forcibly relocated in this manner. The bulk of deportations involved Aramaic speakers, and as a result this policy greatly contributed to the Aramaization of large parts of the Middle East. Aramaic was to remain the most widely used language in this region for centuries; for example, Jesus would have spoken Aramaic in everyday life. It was only with the coming of Islam that Arabic began to replace it as the language for millions of people. Aramaic was an easy language to learn, and also had an alphabetic script, closely related to Phoenician and Hebrew. This made learning to read and write much easier than with the old cuneiform scripts of Sumeria and Akkad, which the Assyrians had previously used. Paradoxically, therefore, the policy of deportation must have greatly helped the spread of literacy in the Middle East. As for the Assyrians, they too also began to speak Aramaic (their original language having been Akkadian). The ruling class may have continued to speak Akkadian to some extent, and they certainly used its cuneiform script (in a smaller, more refined style than previously) in government and administration. However, Aramaic made headway even in these exalted circles, and in 752 BCE it was made an official language of administration alongside Akkadian. The Assyrians shared in the religion of the Mesopotamian civilization at large. This involved the worship of many gods, though with the god Ashur, the national god of Assyria, taking the chief place in the pantheon. Like all Mesopotamians, the Assyrians had a deep and all-embracing belief in signs and omens. The gods, they felt, were always wishing to communicate their wishes to men, and did so through the movements of sun, moon or stars, the flight of birds, the state of chicken livers and so on. No major decision was taken without consulting priests on whether it was in the will of the gods. This included major issues of state, and the king had a staff of expert astrologers to aid him in his policy-making. Information about Assyrian society is scant; the following represents a best stab at an outline based on current evidence. Assyrian society was divided into three groups: free Assyrians (with “free” meaning not subject to personal servitude, rather than enjoying the freedoms that citizens of Western democracies expect); serfs (or “dependants”) on royal and other estates; and slaves. All three categories had defined rights in Assyrian law; even slaves were not on a par with cattle in the way that, say, Roman slaves were. The wide-ranging Assyrian conquests did not give rise to a vast slave trade as Roman expansion would, in which human beings were traded on the free market. Conquered populations became free subjects of the Assyrian king, even if deported to another area within the empire. At the other end of the social scale, the Assyrian royal family headed a landed aristocracy which had dominated Assyrian society from time immemorial. It was from this that the bulk of ministers, commanders, provincial governors and high officials were selected (though not all, see above). They had estates both within Assyria and scattered throughout the empire. These will have been farmed by unfree workers, whether serfs or slaves. However, the majority of Assyrians themselves seem to have been free peasant farmers, owning their own plots of land. It was these whose obligation to do military service provided the recruits for the core of the Assyrian army. The towns and cities will have had the usual population of craftsmen and workers, but they also had an elite group of leading citizens, made up of priests, scribes, merchants and leading craftsmen, plus families of those who owned estates nearby. In the vassal kingdoms and provinces, the pre-existing societies continued more or less as before, unless their population had been completely uprooted. In this case they soon lost their identity and were absorbed into Assyrian society. They will undoubtedly have been second-class citizens, but probably only for a generation or two before being fully absorbed into the society of the Assyrian empire. For one of Assyria’s enduring legacies was to break down local barriers and create an international Aramaic-speaking society which covered much of the Middle East (see below). During this period in the Middle East’s history, iron came into wide use, as we have seen. This must have begun to make farming more productive, as for the first time in world history farmers were able to replace or supplement their implements of wood, bone or stone (which their forebears had used since the Stone Age) and start using tough but inexpensive iron tools. However, although the coming of iron would undoubtedly have a huge impact on agriculture and the economy in later times, the generally poor character of the Assyrian level in excavated sites in countries occupied by the Assyrians (and the frequent references to spoil, massacre and destruction in the royal annals), points to impoverishment, or at best stagnation. Clearly, the tribute exacted from the provinces was so high that economic development was stifled. Similarly, the mass deportation of different peoples, and the Aramaization of the Middle East which resulted from this (see above), might have been expected to foster higher levels of long-distance trade. Of this there is no evidence during the Assyrian period. Perhaps the deportees were too traumatised or demoralised; perhaps trade was unable to flourish in the atmosphere of constant resistance and rebellion which pervaded the Assyrian empire; perhaps the tribute levied by the Assyrian government was simply too onerous to leave much wealth over for commerce. In any case, the archaeological record shows no flourishing cities outside Assyria itself. Within the Assyrian homeland, however, the great cities of Nineveh, Harran, Nimrud and Ashur clearly flourished. Kings such as Sennacherib undertook an enormous amount of construction work, erecting temples and other public buildings, restoring towns, and completing great irrigation schemes which boosted agriculture in the country. Clearly, Assyria was benefitting from the wealth extracted from her subject peoples. The Assyrians were the inheritors of Mesopotamia’s long history of cultural achievement. In fact, modern scholars have much to be grateful to the Assyrians for, as they collected or commissioned thousands of documents which contain literary (myths and legends) and other texts from previous periods of Mesopotamian history, and stored them in huge libraries. These documents, written on clay tablets, have been found in the ruins of Assyrian palaces and temples, to be studied in museums and universities around the world. Many of the Assyrian monarchs were men of culture and refinement, as well as being fearsome warriors. Ashurnasirpal (669-627 BCE), for example, had a taste for zoology and botany, bringing back from the lands through which he “travelled” exotic animals and plants for the imperial parks and gardens at home. Under Assyrian patronage Mesopotamian artists and craftsmen reached a peak of perfection in their work. The royal tombs of Nineveh and Nimrud have yielded jewels of such quality and quantity to utterly astonish the archaeologists who found them. It has been estimated that the amount of gold discovered was over 57 kilos; and the skill with which they were fashioned, marrying gold with ivory, alabaster, glass and semi-precious stones, made the hundreds of jewellry items objects of immense beauty. The Assyrian kings also had a passion for building – the mark of all great Mesopotamian monarchs. They built themselves magnificent palaces, temples and other public buildings, and laid out beautiful royal parks. Some built whole new capital cities, whilst others extended and beautified existing capitals. Nineveh was probably the grandest city of its day as befitted its status as the capital of the world’s mightiest power. Unsurprisingly for an imperial power, the Assyrians injected a new scale into Mesopotamian art. The style of their sculptures and friezes remains faithful to past Mesopotamian norms, but many were far larger than previous examples. This can be clearly seen today by all visitors to the British Museum, in London, where one of the main ground floor halls is dominated by several enormous statues of mythical beasts taken from Assyrian archaeological sites. For the most part, in line with previous Mesopotamian art, the Assyrians did not produce sculpture in the round, but friezes. Many of these are of superb quality. Lifelike and detailed (even when depicting mythical monsters! ), the artists have breathed life into these works by bringing a new fluidity to the subject matter. Some of the reliefs are colossal subjects, to be displayed on the outer walls of palaces; others were designed to appear on interior walls, where they could be viewed close-up. These were intricate and exact in their workmanship, and would have been brightly painted in their day. The Assyrians seem also to have taken the art of landscape gardening to a new level, laying out vast parks and gardens near their palaces and diverting whole rivers to water them. It seems likely that the famous Hanging Gardens of Babylon, as reported by the Greek writer Herodotus, may actually refer to Assyrian parks. No evidence of such gardens have been found in Babylon, while there is compelling evidence for large-scale, sophisticated landscaping in Nineveh. The Assyrian empire’s legacy to world history is significant. As one of the final chapters in the long history of ancient Mesopotamian civilization, the Assyrian empire acted as a conduit of Mesopotamian know-how to later peoples. It was through them that the Greeks learnt about Mesopotamian science and other knowledge, which had a major impact on their own thought.